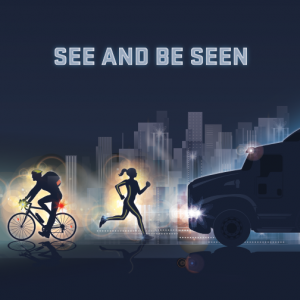 Be Seen! Jogger’s 6 safety tips! 02 Apr Be Seen! Jogger’s 6 safety tips! Don’t assume you are seen! Be sure! BE SEEN! Always wear clothing that can be seen from a distance. Reflective wear, or even a reflective vest is the best, but at least wear clothing that is a contrasting color from the environment. Even during the day, runners in dark clothing can be difficult to see in shaded neighborhoods or busy streets. LIMIT EARPHONE USAGE! We all like to use headphones when running, but just use one earphone. Listen for sounds around you to alert you to danger. WATCH THE TRAFFIC! Never assume that you are seen! Watch the traffic at all times. Never be looking at your phone or off in the distance when running on a street. You assume that the traffic is watching you, but how many of the driver’s are looking away and distracted? RUN WITH A PARTNER! This increases visibility and safety. However, in narrow streets, or back roads with no shoulders, run single file. LEAVE WORD! Make someone aware that you are out running. If you don’t show up when planned, they will know where to look. BE IDENTIFIABLE! Have identification on you. Be sure someone will know who you are and who to contact in an emergency. Running is exhilarating and a popular means of exercise, but be wise in your use of public roadways that you share with other road users. It can be the difference between life and death or serious injury for you. all highway fatalities between 2011-2016.
steadily climbed between 2014 and 2016.